This is an easy to take pill filled with Biotin. It promotes healthy hair, skin and nails. In an easy to swallow tablet, It is a dietary supplement. 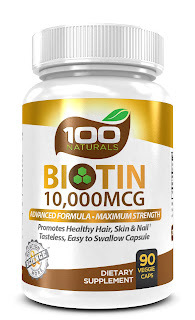 As with most supplements I wanted to know everything about Biotin and how its works as its a new product to me. I have been using this for little over a month. I have extremely thin hair and not to healthy these days. My skin has been just crap with it being hot and sweating or with bug bites. I get these bad freckles all over when it's really hot. Also, I find that in the summer my rosacea really acts up and makes my cheeks burn. While using this supplement. I found that my skin was not so bad this summer. It's been really bad while doing the review for 100 naturals and I'm impressed. I noticed that my nails were actually breaking less and almost had a nice shine to them. My rosacea was still a bit stingy in the sun but was bearable. The one place I haven't seen a difference is in my hair. I don't know if it's because my hair is super thin or extremely damaged but I will keep taking the supplements and see what happens. I love the difference in my skin so this is something i will keep ordering.